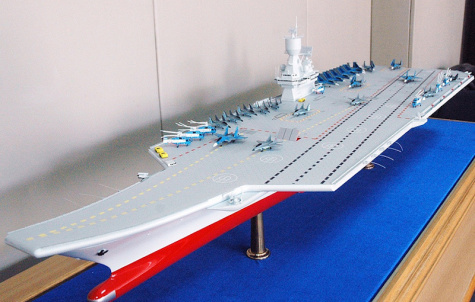 MOSCOW --- The Krylov State Research Center has come up with a fundamentally new design concept of what may become Russia’s future semi-catamaran aircraft carrier, the center’s spokesman told TASS. The model of a future non-nuclear multirole aircraft carrier was presented for the first time at the Army-2018 forum at the end of August. The proposed project has no name yet. "The semi-catamaran design of the ship’s underwater part is the project’s key distinguishing feature," the spokesman said. Normally catamarans have two parallel hulls and a superstructure platform connecting them. The proposed semi-catamaran hull will resemble a dovetail, bifurcating toward the stern. The company’s spokesman said the new design pattern’s main advantage was a large flight deck (as wide as that of heavy aircraft carriers) and smaller displacement. The flight deck area is a crucial factor for the number of planes the ship can carry. "An average displacement ship is capable of carrying a full-scale air wing," the specialist said. No V-shape hull aircraft carriers have been built so far. The Krylov Center said the proposed aircraft carrier’s water displacement will be 44,000 tonnes, length - 304 meters, deck width - 78 meters, draught - 8.5 meters, full speed - 28 knots, and cruising range - 8,000 miles. The ship’s air wing will consist of 46 aircraft: 12-14 Sukhoi-33 fighters, 12-14 MiG-29K/KUB fighters, four early warning and command aircraft and 12-14 Ka-27 helicopters. Russia’s only medium class aircraft carrier The Admiral Kuznetsov having a far greater displacement (59,000 tonnes) carries the same air group - up to 52 planes and helicopters.